Tradition is comfortable. That’s why we still bother with the imperial measuring system, even though it’s bizarre and doesn’t convert all that well and is a quintessentially English thing even though we had a war to say that we weren’t quintessentially British. That’s why people always approach the idea of a liter bottle of wine as something that must be flawed. We raise our eyebrows and hem and haw because surely 250 ml makes a difference in quality. Well, the secret is out - it doesn’t, and we’re celebrating winemakers who have embraced this format to give you, dear consumer, a little over 8 oz more of wine without charging an arm and a leg. Sure, deals may be scary, but we’re here to help. Torrontés was a happy accident, a crossing of Muscat of Alexandria and Criolla Chica, the Argentinian name for Pais, or the Mission grape. It is most prominently grown in the northern Argentinian province of Salta, but is also found in Argentina’s famous Mendoza province and La Rioja, where the Loca Linda is made. The grapes are sourced from the Valle de Famatina, which is 1,000 meters above sea level, allowing for more cool temperatures and a longer ripening process. They also make a blend of early picked grapes with fully ripened grapes to allow for a balance of that acidity with full developed fruit flavors. Being the wild child of Muscat of Alexandria, it’s no surprise that Torrontés is highly aromatic, with lots of notes of lemon peels, peaches, and rose petals and a brisk acidity with great salinity. One vine in every three grown in Austria is Grüner Veltliner, and for such a prominently grown grape, there was almost no familiarity with this refreshing white wine until the 1990s. Now, it’s a easy choice for any restaurant to include on their wine list, especially by the glass. In general, Grüner Veltliner is a very refreshing wine, with notes of white pepper and stone fruit, making it a wonderful alternative to the high acid Sauvignon Blancs from New Zealand and France. This is in no small part due to the cooler mountain climate of Austria. In the Wagram, which was formerly known as the Donauland until 2007, we find Paul D. a young hotshot organic wine producer who has been champion of the liter bottle format as long as we’ve carried his wines. If you’re looking for an easy introduction into the wonders of Grüner Veltliner, here’s where you should start. One of our favorite recent discoveries, Opi d’Aqui Fatal is a unique natural wine cuvee, with seperate vintages of two grapes that have been vinified separately from the Languedoc. The Grenache is from 2014 and is aged in stainless steel while the Carignan is aged in neutral oak, though both are fermented carbonically. Carbonic maceration is a way of fermenting red wine that differs from the standard, yeast-fueled fermentation. Unlike standard fermentation, in which yeast is manually or naturally added to grape must to convert sugar into alcohol, carbonic maceration does not use yeast to start fermentation. How is this possible? It’s a complicated matter, but by placing whole bunches of grapes in a sealed vat filled with carbon dioxide, the oxygen-starved fruit will release naturally present enzymes. These enzymes perform a similar function to yeast, breaking sugars down into alcohol. Essentially, during carbonic maceration, alcoholic fermentation begins inside the grape itself. Cool, right? Most wine lovers explaining carbonic maceration stop there, but alcoholic fermentation doesn’t solely occur inside the fruit; it just kicks it off. Grapes won’t remain intact beyond 2 percent ABV; after this point, they split open to expose the juice and flesh. Typically, a winemaker will choose to press the grapes before this point, taking the fermenting juice out of its anaerobic environment and exposing it to oxygen. Yeast will then step in to finish the job, completing the fermentation of sugar into alcohol. Opi d’Aqui is dedicated to producing organic and biodynamic wines, with an emphasis on no added sulfites in the process, Based in the village of Garrigue in the Languedoc, Opi d’ Aqui is a phrase in the local Occitan dialect that means “Opium from here” in reference to the power and influence of wines in the region. Speaking of unusual finds, this cuvee from Tuscan winemakers Monte Bernardi is a blend of grapes sourced from Tuscany, the Marche, and Sicily as a means to represent all sides of Italy, and wines of all styles. This “little” liter combines Sangiovese, Malvasia Nera, Canaiolo, Frappato, Nerello Mascalese, and Nero D’Avola into one neat package. Harvested at different times, these grapes are all vinified separately, with 80% fermenting in concrete while the other 20% ferments in stainless steel. The combination works surprisingly well, and each grape is farmed organically. It’s an approachable yet beguiling fun red blend, and it makes a statement on more than just the package alone. Fausto and Cinzia Cellario are 3rd generation winemakers who make their home on the western outskirts of the Langhe in the village of Carru. They’re fiercely dedicated to organic winemaking and Piedmont varietals, and ‘È Rosso’ is their wine for the people. Made with 100% Barbera, this is more of a fresher and lighter style than the ripe and heavy Barbera d’Albas that we’re accustomed to. After maceration for 10 days, the wine is fermented in 100 hectoliter cement tanks for a year. With just a hint of leather, this wine is full of notes of early picked blackberries while still fragrant and fresh, and it’s got a pop-top! Who needs corks when you can just grab your trusty can opener and open up this friendly liter? 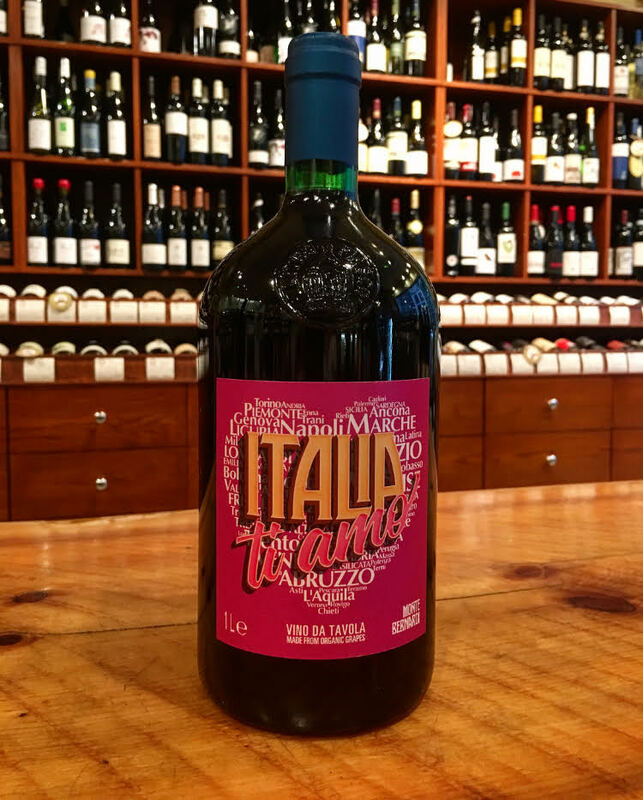 We dare you to venture away from those dastardly 750 ml bottles, even if only for a week, and enjoy what the wine world is starting to embrace, the liter bottle! It’s a whole new glou-glou.